DNA is a long polymer of deoxyribonucleotides. Length of DNA: The number of nucleotides present in a DNA is called the length of DNA. A pair of nucleotides is called a base pair. Number of base pairs in a DNA is also taken as the length of DNA. The length of DNA is also the characteristic of an organism. For example, Escherichia coli has 4.6 × 106 bp, and haploid content of human DNA is 3.3 × 109 bp. A nucleotide has three components: a nitrogenous base, a pentose sugar, and a phosphate group. There are two types of nitrogenous bases – Purines and Pyrimidines. Purines: There are two purines, viz. Adenine and Guanine. Pyrimidines: There are three pyrimidines, viz. Cytosine, Uracil and Thymine. Cytosine is common for both DNA and RNA and Thymine is present in DNA. Uracil is present in RNA at the place of Thymine. A nitrogenous base is linked to the pentose sugar through an N-glycosidic linkage to form a nucleoside, such as adenosine or deoxyadenosine, guanosine or deoxyguanosine, cytidine or deoxycytidine and uridine or deoxythymidine. When a phosphate group is linked to 5'-OH of a nucleoside through phosphoester linkage, a corresponding nucleotide is formed. Two nucleotides are linked through 3'-5' phosphodiester linkage to form a dinucleotide. More nucleotides can be joined in such a manner to form a polynucleotide chain. A polymer thus formed has at one end a free phosphate moiety at 5'-end of ribose sugar. This end is referred to as 5’-end of polynucleotide chain. At the other end of the polymer the ribose has a free 3'-OH group. This is referred to as 3'-end of the polynucleotide chain. Sugar and phosphates form the backbone of a polynucleotide chain. The nitrogenous bases linked to sugar moiety project from the backbone. It is made of two polynucleotide chains, where the backbone is constituted by sugar-phosphate, and the bases project inside. The two chains have anti-parallel polarity. It means, if one chain has the polarity 5'→ 3', the other has 3' → 5'. The bases in two strands are paired through hydrogen bond (H-bonds) forming base pairs (bp). Adenine forms two hydrogen bonds with Thymine from opposite strand and vice-versa. Similarly, Guanine is bonded with Cytosine with three H-bonds. As a result, a purine always comes opposite to a pyrimidine. This generates approximately uniform distance between the two strands of the helix. The two chains are coiled in a right-handed fashion. The pitch of the helix is 3.4 nm and there are roughly 10 bp in each turn. Consequently, the distance between a bp in a helix is approximately equal to 0.34 nm. The plane of one base pair stacks over the other in double helix. This stacking, in addition to H-bonds, confers stability of the helical structure. The Central dogma in molecular biology states that the genetic information flows from DNA → RNA → Protein. In prokaryotes, the DNA is not scattered throughout the cell. The DNA is negatively charged. It is held with some proteins (which are positively charged) in a region termed as ‘nucleoid’. In the nucleoid, the DNA is organized in a large loop held by proteins. The organization of DNA is much more complex in eukaryotes. There is a set of positively charged, basic proteins called histones. Histones are organised to form a unit of eight molecules called as histone octamer. The negatively charged DNA is wrapped around the positively charged histone octamer to form a structure called nucleosome. A typical nucleosome contains 200 bp of DNA helix. Nucleosomes constitute the repeating unit of a structure in nucleus called chromatin. 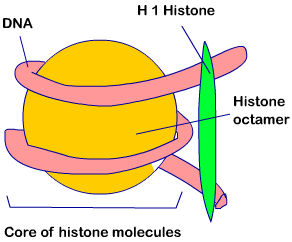 Chromatins are thread-like stained (coloured) bodies seen in nucleus. When viewed under electron microscope, the nucleosomes appear as ‘beads on string’ structure. Non-Histone Chromosomal (NHC) Proteins: The packaging of chromatin at higher level requires additional set of proteins. These proteins are collectively called non-histone chromosomal proteins. Euchromatin: In a typical nucleus, some regions of chromatin are loosely packed. These stain light, and are called euchromatin. Euchromatin is transcriptionally active chromatin. Heterochromatin: Some chromatins are densely packed. They stain dark, and are called heterochromatin. Heterohcromatin is transcriptionally inactive.